"If you have ever wanted a math review worksheet that covers different types of problems instead of the same one over and over, you have got to get 10 Quickies!" 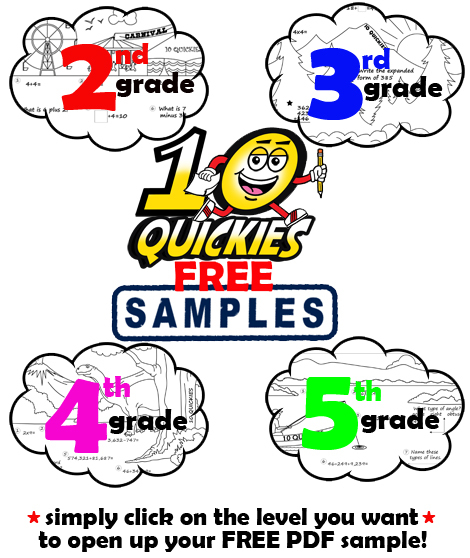 "My students LOVE the 10 Quickies math review worksheets! It's so fun to see their enthusiasm and motivation towards reviewing math standards we've learned."" "Our math time often starts off with 10 Quickies. Takes only about 10-15 minutes and transitions my students nicely into our math lesson." Here's an EASY way to get your kids excited about reviewing math! To download your four FREE 2nd, 3rd, 4th or 5th grade samples, simply "right-click" the grade level image of your choice below and select the option "Save link as..." to save the PDF to your computer. No need to sign up for anything. No need to submit your email address. A true freebie plain and simple. Hope your kids enjoy the 10Quickies math review worksheets! We have the 2nd, 3rd, 4th and 5th grade series available each with a total of 100 original, one-of-a-kind 10 Quickies math review worksheets. Here's the perfect opportunity to have your kids solve a variety of grade level problems and help them develop automaticity when it comes to math! Once you place your order, you will have instant download access to the 10 Quickies math review worksheets in PDF format.